1974 "reunion" album from the Chambers Brothers, with a wonderful version of "The Weight". As the Chambers Brothers toured rock clubs (including the famed Fillmore in San Francisco) and R&B venues (most notably the Apollo Theatre) alike, their music increasingly embraced elements of both; after recording 1968's Shout! for the Vault label, the group signed to Columbia to issue Time Has Come Today, scoring a major pop hit with the title track, an 11-minute psychedelic soul epic in its original album incarnation. The follow-up, A New Time--A New Day, yielded another Top 40 hit, a cover of the Otis Redding's classic "I Can't Turn You Loose," but subsequent efforts including 1969's Love, Peace and Happiness and 1970's Live at Fillmore East failed to maintain the commercial momentum. 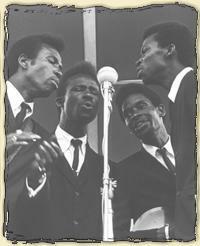 Upon completing 1972's Oh My God!, the Chambers Brothers disbanded, only to reunite two years later for Unbonded. Right Move appeared in 1975, and although no new studio records were forthcoming, the group regularly performed live in the decades to follow, with the brothers also pursuing individual projects; the Chambers Family Choir, a gospel group including the siblings' own children, remained a priority as well.